Here's the second part of our dark and ghoulish Horror Double Feature for Halloween and once again we take a look at another one of Ross Collins' creepy and ghostly creations. When a young child discovers she's being haunted by a rather rude, rather large and rather mischievous ghostly elephant, the poor girl soon finds out that having an Elephantom kicking around the house isn't as great as it sounds. Entire jars of peanut butter go missing. Chaos ensues, and the poor girl turns to her grandmother in desperation to see if she has any advice. Granny is no fool and soon recommends the services of a certain mystical gent working in a fantastic shop called "Spectral and Sons". Will the girl ever be rid of her unwanted elephantine house guest? "The Elephantom" is beautifully observed, funny and ghoulish and entertains without being too scary for more timid children who don't particularly like their bedtime spooky stuff too dark or too unnerving. Charlotte's best bit: DOCTOR WHO!!! Look it's Doctor Who, Daddy. What's Doctor Who doing in there? ("Spectral and Sons" has a rather fetching Police Public Call Box on its shelves). Daddy's favourite bit: Here's something fairly subtle and something that made me smile. The expression on the Elephantom's face. He knows he's a bit naughty, he knows he can get away with it. All the way through the book you see him carrying on without a care until....aha! Spoilers, sweetie, spoilers! Welcome to the spookiest double feature in children's picture books, the ReadItDaddy Halloween Double Review. In part one we'll be looking at Ross Collins' superb vampish story "Dear Vampa" and in part two we'll also be looking at another Ross Collins book, The Elephantom. Dear Vampa sees a young boy writing to his dearly beloved Vampa (Granpa) in far off Transylvania. The poor lad is at his wits end after a new family move in next door to the Pire family, and disrupt their ordinary everyday nocturnal and peaceful lifestyle with loud raucous music, parties and terrible terrible drinks. We readily identify with what it's like to live next door to the neighbours from hell (thankfully we managed to move, and our current neighbours are absolutely lovely!) so this tale touched a raw nerve, but was deliciously funny at the same time. Charlotte wanted to know why the Pires were 'in black and white, while everyone else is in colour' which made me giggle. She's way too young to sit through Nosferatu (or for that matter, any other Vampire movie) but this book entertained her and appealed to her monster-loving side too. There's a delicious twist at the end of this book which you might see coming as soon as the annoying family are introduced. But we'll leave it up to you to see if you can spot it and work it out. It is fantastic though. Ross Collins is definitely an author-illustrator we'll be keeping a very close (bloodshot) eye on. 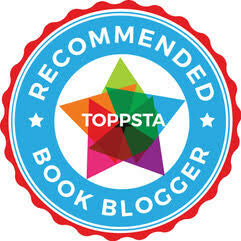 Charlotte's best bit: Really really want to tell you what it is but it would spoil the 'twist' of the book. It involves her saying a particular character was her - but very rapidly changing her mind later on. Daddy's favourite bit: Ross Collins' eye for all those lovely little horror in-jokes and nods to Bram Stoker's most beloved creation. Love it. Here at ReadItDaddy we've covered several storytelling apps but we're always on the lookout for projects that do things a little differently. ITV have developed a brilliant new app, Signed Stories which sees the company partner with Child's Play, an independent publisher specialising in whole child development, focused play, life skills and values. Signed Stories uses UK and US sign language (complimented by narration, music and subtitles), making it ideal for deaf children and children with special educational needs, including autism, Asperger's, dyslexia and Down's Syndrome. Child's Play's excellent version of "Three Billy Goats Gruff" is included with the app to get you started, and further books from the Child's Play range can be bought through the in-app store. ITV's chief executive Adam Crozier said "ITV is proud to be creating something which every child can use - an English language app which is totally accessible. Too often deaf children and those with special needs get left behind,"
"Anytime, anyplace viewing is becoming the norm and we believe all children should be able to enjoy the mobile digital world. We're a global brand. The American version is a response to requests from the deaf community in the USA for access to children's books in its own sign language." Child's Play CEO Neil Burden also added "In 2008, we embraced wholeheartedly the opportunity to work with the Signed Stories website, and we're delighted and honoured to be chosen by ITV as their launch partner for this exciting new venture,"
"These apps continue and further our attempts to make our publishing as accessible and inclusive as possible. They stand out from the myriad of book-based apps currently published for children in that they have manifestly useful and engaging content, outstanding production values and, perhaps most of all, genuine purpose." We'll be taking a more detailed look at the app, and also bringing you a spotlight article on Child's Play's commitment to inclusive books very soon. Though primarily for iOS devices, the app is also coming to Android platforms at some point in the future. Please take a moment to visit the Child's Play website article on Signed Stories, as well as the ITV Site devoted to the app. Debi Gliori is a lovely person to tweet to, and she let slip a few pearls of wisdom about "The Snow Child" that made us smile. I told her how Charlotte always wished for snow, and that the stuff we get down here "darn sarf" isn't the real thing as depicted in her book. Debi told me that her agent said "The snow's a bit unrealistic in Snow Child, we don't get snow like that in London" which caused much rolling of the eyes for poor Debi. You see, her neck of the woods is the (frozen) north in Bonnie Scotland where you know you've had snow when you can't tell where your car ends and the kerb begins. The other thing she told me about real snow was how your toothbrushes freeze! Eeek! We think this book is lovely, first because it tells such a beautiful story about a lonely young girl who can't quite 'fit in' with the circle of friends in her neighbourhood. Try as she might, she always seems to be one step behind their games but she's lovely and kind, and we couldn't work out why the other children were so mean (Kids can be so cruel - any Simpsons fans are now imagining Bart saying "We can? Thanks mom!" and then running riot). 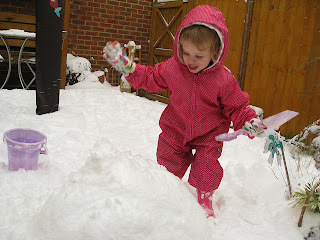 The girl decides to make her own friends one day after a heavy snow fall and so begins to make a snow child. A dumpy little snowman, kitted out with all the proper snowman accessories like coal eyes, a carrot nose and a cast-off hat and scarf. As she returns to her home to grab some extra goodies to make another friend, she notices someone else has beaten her to it. In fact another girl has made a snowman right next to her dumpy little snowchild. What happens next is beautifully told and a real heartwarming story - just the sort of thing you need on a day like today when the first frost sees off the last of your tomatoes, and the garden is full of birds making very good use of your bird feeders. A lovely book. You might have to hunt around for it as it's fairly old, but we were lucky enough to spot this in our local library so jumped at the chance to review it. Charlotte's best bit: "Proper snow Daddy, I really want proper snow!" Daddy's favourite bit: Wholly identifying with the girl in this story, and such a beautiful story it is too. One of the things Toca Boca do well is respinning the sort of apps that are extremely common on the app store with the 'Toca Boca' take on things. This usually means high production values and hour after hour of your little ones being totally absorbed in their brightly coloured world. Toca Tailor is no exception. We've seen a million and one dress-up apps, and most like to ensure that though you get a free app, you pay through the nose for content. Toca Tailor draws a line neatly through this by having fairly well-defined boundaries, within which you are free to create some of the wildest and whackiest fashion creations for your cute and appealing Toca characters. First, you start by discretely adjusting the length of your character's dress /shirt and sleeves. Then you can begin to accessorise with a range of hair decorations, jewellery and other goodies. Last but by no means least you can pick through different types of shoes and boots for your character. So far, so good, it all sounds pretty standard but there's a neat twist to proceedings when you realise that you aren't limited to the built-in patterns on offer here. In fact, with the aid of your iPad (or iPhone) camera, you can sample textures and patterns from the real world. Once you've finished creating a fashion masterpiece, you can take a photo of your character AR-style. Place her in your room, next to you, even standing on your shoulder. Like most of the Toca Boca apps, children can lose themselves for hours in something that is, in essence, a fairly simple core idea given some serious window dressing. We picked the app up when it was at its introductory price (69p) and Toca Boca stuff can go as high as £2.49 so grab it while you can while it's still cheap. Charlotte's best bit: Taking photos of her characters 'cuddling' her, and taking a photo of her T Shirt design so her character and her can be "Twins, Identical Twins!" Daddy's favourite bit: A very slick take on the 'dress up' genre. As great as this is, it does lay down some fairly rigid parameters early on (like most Toca Boca apps seem to) - that said, it does keep Charlotte occupied for ages so a big thumbs up. When I was a wee whippersnapper, my two best friends were two girls - one called Selma and one called Merrel. Merrel had Spinabifida and had also suffered severe birth trauma and when I first read "Just Because" it took me back nearly 40 years to a time when the three of us were as thick as thieves. Selma (we used to call her the naughty one because she was always daring us to do really daft things like drink pond water or see if the insides of Rosehips really did work as itching powder by testing them out on ourselves - Note to kids: Do NOT try that one at home) loved Merrel with the kind of unconditional love that children reserve exclusively for their close siblings. Merrel was in a wheelchair and could not speak (she could make noises, much like the little girl in "Just Because") but she was awesome and I'd never met anyone else like her. As children we don't see 'different' until it's pointed out to us by others (usually adults, sometimes well meaning, sometimes cruel). Rebecca Elliott's "Just Because" absolutely captures the essence of this and Toby, the young lad in the story absolutely adores his big sister Clemmie. She's beautiful, she's funny, she has the most amazing hair on the planet and she has a cool wheelchair that can visit the moon. Most of all, he loves her "just because". The most touching part of this book wasn't just that it almost made me burst into tears with the sharp and distinct memory of Selma and Merrel, but Charlotte's reaction to it. She asked a lot of questions about Clemmie but she asked them because she wanted to understand her own response to the story and then she asked that $6 million question - "why did this happen to Clemmie?" Which is, of course, a question I couldn't answer. "Just Because" just didn't seem adequate enough. This is one of the most beautiful children's books ever written, handled in such a thoughtful and also thought-provoking way. I defy anyone not to feel a lump in their throat reading this, there are so many reasons why it can't be praised enough - from spellbinding illustrations beautifully painted by Rebecca herself, to the quiet and understated beauty of Clemmie as a character. There's another Clemmie and Toby book called "Sometimes" and I really really want to read that now! Daddy's favourite bit: It'd be impossible to list all the tiny and beautiful little moments in this book that struck a chord with me, suffice to say that this is an incredibly important book that (to use a well worn cliche) really should find its way into the hands of every child. Oxford-based Lion Press were kind enough to send us a lovely bundle of books to review. 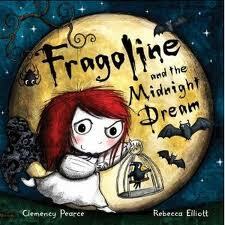 We've previously reviewed Rebecca Elliott and Clemency Pearce's wonderful "Fragoline" (which is also in our Halloween Top Ten, by the way!) so I was intrigued to see Rebecca's other work. Zoo Girl is the touching, bittersweet and utterly beautiful tale of a young girl in an orphanage. She is lonely, she doesn't have any friends but in a flash of inspiration she finds her way into the local zoo - and discovers a whole host of animal pals to snuggle up to. The beauty of this book is how the illustrations are so wonderfully done, that the text can be kept to a bare minimum. Just one or two words per page (which, by the way, also means it's a fantastic book for early readers who love to spell out and speak words as they're learning to read). One or two very well chosen words that are capable of putting across such a strong emotional message in tandem with the illustrations. Something happens as you read Zoo Girl. It's almost as if the whole world around you turns its volume down to 1 or 2 from its usual blaring '11' setting. If I had to describe it, it's the same thing that happens after a heavy snowfall - it's so utterly absorbing that you feel like you've been snuggled in a beautiful warm blanket, and even though the book starts off quite starkly with some fairly strong (and sad) moments, it will make you very happy by the end (and like me you'll probably feel like bursting into tears). Daddy's favourite bit: The end (I won't spoil it) but oh I so nearly blubbed like a baby. TOCA Tailor is out today at a reduced price! TOCA Boca recently had a sale on all their fantastic apps for iPhone and iPad to celebrate the launch of their latest greatest creation, TOCA Tailor. Being such a fantastic bunch, they're selling TOCA Tailor today on launch day for the absolutely stupendous price of 69p on both iPhone and iPad. Don't delay, grab it today! Wondering what it's all about? Here's a fantastic video explaining how you can become an expert fashion designer at the touch of a screen! I apologise in advance for this mini rant. I recently found myself in the unique position of being a bit miffed about something encountered on a (usually quite excellent) book blog and felt compelled to add my two penneth. My two penneth was subsequently deleted from the blog without explanation (actually no, it wasn't even published) so I thought I'd air it here. Our daughter (and the "boss" of this blog) Charlotte is a girl. Charlotte loves pink. Not exclusively, but she definitely loves pink. When we first knew we were having a child, we wanted the surprise of not knowing the gender before the birth. Naturally this meant that before she was born and we went clothes / toy shopping, we opted for those drab beige and neutral colours that you can get most baby clothes in. We opted for a 'safe' coloured baby carrier and pram and picking our way through the minefield of what is now termed 'gender specific colours' wasn't a massive problem. Now of course, it's a huge bone of contention for a lot of parents who feel that marketing is dictating to them what their girls and boys should like and should be into. As you can see from the attached pic, this goes beyond the mere 'gender specific colour differentiation' thing - it suggests that while boys love fast cars, dinosaurs, footballs and robots - girls prefer skipping ropes, princesses, bags and crowns. (There's a clue in the word 'Marketing' by the way. Anyone in the business of making money from selling products wants to do a lot of it so that they can make more products, make more money - and so on, and so forth. That said, I have never met anyone involved in marketing that put me in a hurt hold, marched me down to a store and made me buy something while I screamed in protest). We had a recent experience where Charlotte chose a pink covered book (Emma Dodd's "Cinderelephant" - which is a regularly demanded bedtime read, by the way. She loves it!) mostly because it was a huge pink book about Cinderella (as an elephant). We didn't think much to the book but we relented. Now, to our knowledge, Charlotte hasn't been brainwashed at preschool or school into liking pink or princesses, she just does. But Charlotte also likes robots, witches, dinosaurs (oh boy, does she ever love dinosaurs), monsters and a whole ton of other things that cross and re-cross the supposedly rigid 'forced on us' gender boundaries. 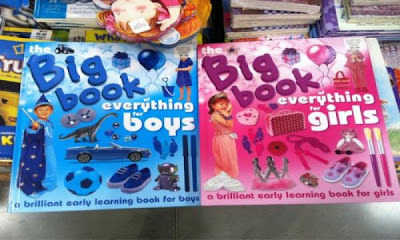 So what are we to make of the constant coverage in the book press, from publishers and from bloggers that suggest that huge sweeping changes need to be made in the industry to prevent the nefarious spread of gender stereotyping, particularly when the colour pink is involved? Simple answer really. Stop pushing your own agendas, ideas and hangups on your children and let them choose what they read by introducing them to as broad a range and as many books as possible, whatever colour the covers are. No marketer alive can stop you doing that. The Red House Children's Book Award Blog Tour - We're in! We're very pleased to announce that we've signed up to become part of the Federation of Children's Book Groups Red House Children's Book Award Blog Tour. Phew, that's a mouthful but it basically entails something rather cool and special happening on November 1st. We've got to keep mum for the time being but we're lined up alongside some of the best book bloggers in the business for the tour (including some of my fave book bloggers Library Mice, Child Led Chaos and Playing by the Book). Keep an eye on the blog for the next few days up to November 1st. In the meantime drop by the Red House Children's Book Award Blog Page and find out a little more. Excited? You bet your sherbet pips we are! "Ou vas tu passe les vacances, Pere Noel?" - Alright that's the extent of my French language skills but where on earth does Father Christmas go on his summer holidays? Raymond Briggs' bloomin' grumpy take on Father Christmas is back and this time he's planning to get away from it all, soak up some sun and some fine food and take some much needed R & R.
Only, when you're a slightly portly chap with a beard, it's a little difficult to blend in. Father Christmas tries his best, dressing like the locals and indulging in local customs and cuisine but sometimes the best holidays can be had at home sweet home. I think Charlotte, Mummy and I actually loved this book more than Father Christmas. Fun, festive and full of those in-jokes that go completely over kids' heads, but adults laugh out loud at. 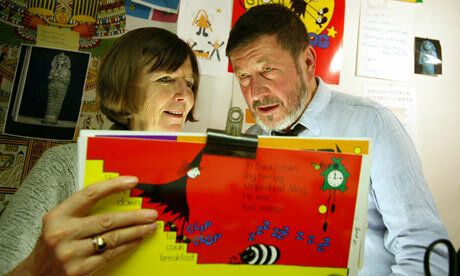 Raymond Briggs is deservedly a legend in children's picture books. Charlotte's favourite bit: Father Christmas toasting himself to a crisp on the beach. Daddy's favourite bit: The harrowing and surreal 'Cream' dream. EEEK! TOCA Monsters Kitchen (Free) - Well this one's not in the sale obviously but this was the first TOCA app we played and absolutely fell in love with it. Monsters, a fridge full of food and lots of ways to prepare it. What does your monster like best? Broccoli and lemons? Om Nom! TOCA Hair Salon Christmas (Free) - It's festive, it's fun and it's frizzy! Test out a trial version of TOCA Hair Salon with everyone's favourite yuletide dude and a happy Christmas Tree. Cut hair, grow hair (I wish! ), dry hair with a hair dryer and colour hair. Awesome! TOCA Hair Salon (69p) - More hairy antics this time with the full version of the free trial. More tools, more hair decorations and a lovely selection of crazy characters to play with. Get snipping! TOCA Robot Lab (69p) - Get Robot, Build Robot, Fly Robot! Put together robot parts in your lab for the ultimate robotic buddy. TOCA Kitchen (69p) - The full version of the Kitchen / Food app. 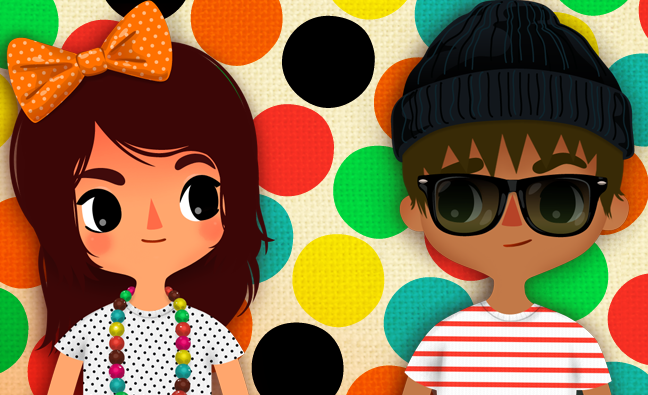 More characters, more food and more fun ways to dish up a tasty treat, TOCA style! TOCA Train (69p) - Tootle around your very own island on a cute little train. Pick up passengers and cargo and drive through beautiful scenery but don't go too fast! TOCA House (69p) - It's like a mini, cute version of the Big Brother house without the wannabe celebrities, the catfights, the rude bits, or in fact any of the other Big Brother bits. Alright, it's better than that - you get to share a house with crazy TOCA characters who all like doing different things to help out. Hang out the washing, hoover the carpets, sort the mail and mow the lawn. Far better than doing any of this for real. TOCA Store (69p) - Run your own little shop by laying out your goods, then encouraging customers to come in to spend their hard earned cash on lovely TOCA merchandise. Oh and robots, and lollies don't forget the lollies. TOCA Doctor Full Version (69p) - ...is also in the sale! For 69p! Heal your patients, fix their broken limbs and give them plenty of TLC TOCA Doctor stylee! Paint My Wings (69p) - A lovely interactive creative app that lets children decorate beautiful butterflies. Great fun for younger iPadders. TOCA Tea Party (69p) - Oh my goodness, the TOCA fun never seems to end. Host tea parties for you and your furry friends at home (yes I'm talking about Dad) - All sorts of tasty and tempting treats are available for you to play with. Save a coconut macaroon for me! Parenting Guide's Birthday Party Play (69p) - A bit like the tea party but this time you can throw a full-scale birthday bash! Cake, lemonade, sandwiches and other treats to share and play with. TOCA Band (69p) - Only just released and it's already on sale. You lucky lucky people! Make your own sounds and tunes with some of TOCA's wildest character creations yet! Wow, heck of a collection. Opportunities like this don't come along every often in the App world so if you fancy spending a little over £7 for a collection par excellence that will keep your children amused for hour after hour, then get clicking those links! If you believe the hype in the supermarket, the constant barrage of yuletide recipies, gift sets appearing on shelves nudging the Halloween stuff aside - it's almost Christmas. So we'll be covering a lot more christmas books over the next few months and no coverage would be complete without at least one or two Raymond Briggs books. "Father Christmas" may sit under the shadow of Briggs' other legendary children's classic "The Snowman" but I love it, not just because it presents Santa as a bit of an old grump (who uses the rather child-unfriendly word 'Bloomin!' a lot!) and after watching the TV adaptation it's impossible to imagine Santa as having anyone else's voice other than Mel Smith's, but because it's just such a cosy feeling book. Santa exists in the real world and has all the real world problems of trying to get down very narrow chimneys (where the heck is the chimney on an igloo?) or dealing with bizarre-shaped presents. But he's a likeable soul despite his curmudgeonly appearance, and we soon warm to his plight of having to deliver a giant sled full of presents across the whole world. Charlotte loves this book mostly because Santa loves his animals (Reindeer, dog and cat) and of course because being nice to Santa means more presents - right? Daddy's favourite bit: Santa meeting the milkman in the early hours of the morning. We're coming at you thick and fast today with our reviews in a bid to catch up after a few days off sick. The divine @thestrollingmum found this rather neat little e-book while browsing the iTunes App Store and it's the sort of thing you'd absolutely love to see more aquariums, zoos and other places begin to do more of. Seattle Aquarium has put together a lovely little story about a Sea Otter called Edwin, but it's not merely a heart-warming tale of an otter worrying he's not as impressive as the other Seattle Aquarium animals and aquatics, it's a great little demonstration of how stories can serve as a jumping-off point for exploring our natural world and learning valuable facts about the creatures that live in it. 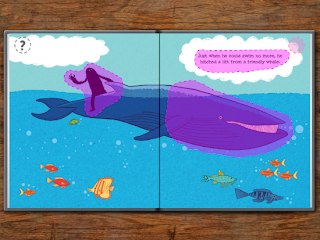 The developer of this app / e-book, Nat Duffy, has obviously taken the very best hooks from picture books and spliced them together with great little video clips from the aquarium itself (with lots of cute animal clips to keep youngsters happy). Excellent illustrations and a fairly engaging story help to underpin the Seattle Aquarium's committment to work in conservation and animal care so it's far more than just a 'glossy' way of advertising a day out. Best of all, it's a free download (and is also available as a static PDF if you want to explore the pages on a desktop computer) but doesn't feel like it's lacking in quality, like a lot of free apps seem to. Charlotte's best bit: Animals going to sleep. Awww. Daddy's favourite bit: A brilliant mix of video, sounds and a great story compliment each other perfectly. Our most excellent friends at PGUK / Blue Apple Books have sent us a rather fantastic and eye-catching book to take a look at. Simms Taback is a name I've not come across before, but it's easy to see why his graphic design skills and children's books are much sought after. Sadly, Simms Taback died in 2011 but some of his best loved books are being reprinted and re-released, along with some new books not previously released. Bold, colourful illustrations are stock in trade of Simms Taback's works, and in this fantastic fold-out Dinosaur book, dinosaur-obsessed children (like Charlotte, who admits to loving the Pterodactyl and Triceratops the most) can guess which dinosaur is slowly being revealed as each massive page unfolds into a giant-sized dinosaur picture. It's sad to think that such a talented individual is no longer with us, but his ideas and his books will most definitely find a whole new appreciative audience. Keeping things child-friendly without piling on tons and tons of text and factual information, 'Dinosaurs' is a great book for kids who are just beginning to learn about our lumbering prehistoric ancestors. Charlotte's best bit: "Triceratops looks cute!" Daddy's favourite bit: Love the idea of the fold-outs. Not sure how long they would last with a less careful child but a brilliant idea for a small format book to extend out like this. When we did our round up of book-based apps recently, we were delighted to preview the Me Books app - a fantastic book framework that encourages children to 'be part of the story', taking well known and well loved Ladybird (and other publisher's) books, and encouraging children to add their own speech to the stories and narrations. The way the app works is quite simple. Each story page has a selection of 'hot spots' on it that can be tapped so that children can either read or speak part of the story themselves, or add lines of dialogue for characters in the illustrations. The Me Books app comes with a real winner of a free book to get your children started (optional books can be purchased in-app from a marketplace page in the app itself). The classic Ladybird Books version of "Little Red Riding Hood" is one of those books you'll remember from childhood, with the trademark fantastic painted Ladybird Books panels illustrating a well known and well loved tale. Hotspots usually appear above text blocks and above areas of interest on the page, but the beauty of Me Books is that you can delete these and make your own if you so wish. Once you've decided which hot spot you want to use, keep your finger on it until it turns red, and you can record snippets of dialogue, silly sound effects or other story-enhancing audio through the iPad (or iPhone's) microphone. Charlotte spent a lot of time "being" Red Riding Hood (guess who had to play the Wolf! Snarrrrl!) and we had a lot of fun with the app. The only comment I'd make on the User Interface is that doing away with any clear markers or physical controls on the book spreads is fine and dandy, and doesn't distract a child's attention away from the book - but in practice it means that you have nothing visual to tell you if you're recording a piece of speech, when a child should start speaking / making noises etc - and having to hold your finger on a hotspot for the duration of your recording can be a bit of a faff. Also there's no real indication on how long you can record for (children tend to ramble if they're thinking up dialogue on the spot unprompted so some sort of a visual timer would've been cool I think). In essence, it works well enough but it's something I'd like to see improved on and refined. The hotspot idea is genius though and being able to draw your own on pages means that your books truly can take on a whole new dimension if children want to go into great detail, giving everything on a page a distinct sound or voice. This screenshot shows some hotspots. Tap on these to record your own voice and sound effects! Once you've finished recording your magnum opus, you can save up to three versions of a book for later retrieval. Where Me Books would come into its own is with an early reader, and I'd seriously love to see the tech used for early reading books such as the Biff, Chip and Kipper series - or Julia Donaldson's excellent Stage 1 and 2 Phonics books. I can really imagine how brilliant it would be for a child to be able to hear their progress and hear how well they're getting on with the core phonics exercises. Go grab the app for free, and see what you think. Every now and again we come across a book idea at ReadItDaddy that is so inspirational and so cleverly done you could almost hug it with glee. MyLittleBigTown Publishing recently sent us several of their latest titles to review, and "Anisha's Adventures in Bangladesh" was the one that caught Charlotte's eye straight away. Authors and Illustrators are always looking for new and innovative ways to help children absorb a book's message, or to help the learning process without a book feeling like a dry reference text. So what better way to teach a child about other cultures, languages and countries than making the hero of your story a little girl they can easily identify with. Anisha is curious, full of adventure and with a little help from her loving grandparents and a pinch of magic, Anisha - along with her magical pony friend and a fantastic camera that can give detailed descriptions of objects along with beautiful photos, sets off on a journey of discovery and delight. Anisha can now travel anywhere in the world so she decides to visit Bangladesh, a country full of interesting historical architectures, fabulous flora and fauna, and a vibrant culture completely different and absorbing. Anisha's journey of discovery is as fantastic as a child's reaction to the book. At an age where Charlotte is soaking up every scrap of knowledge like a hungry sponge, having the chance to learn about a country and culture that is completely different to her own is intriguing and inspiring, and triggered us to take a look at where Bangladesh is on the world map, what the weather is normally like and other facts and figures not covered by Anisha's first (and hopefully not last) adventure out in the big wide world. Thoughtfully written, beautifully illustrated (it's nice to see that Calvin Innes can draw stuff other than bogies and bugs, YAY!) and an extremely clever way of delivering a fabulous learning journey. Fantastic! Daddy's favourite bit: Anisha's fact-finding camera. Such a clever idea wonderfully executed. Year after year, the shops seem to be more and more stuffed to the gills with Halloween things - fortunately this doesn't just extend to horrible cheap plastic halloween costumes and dreadful sweeties, but also some surprisingly brilliant book ideas for your little ones to get spooked by as All Hallows Eve arrives. Usborne's 'Sticker Dressing' range is always good fun, and Charlotte's grampy (Dodo) bought her this rather excellent 'Spooky' edition, featuring all the mainstays of a good halloween romp. What I like about the book is the multi-layered approach to the stickering. The artwork is fantastic, and as you add stickers to each scene to 'complete' it, you can build up some brilliant transformations. See a scrawny skeleton transformed into a scary mummy - or a graveyard turning into the Skeleton World Cup. Imaginative and full of flair, Sticker Dressing - Spooky is still great fun even after your little ones have stuck all 200 stickers down and made some funny scenes. Great character names and plenty of opportunities to then go away and draw up some spooky scenes of your own all add to a book that's sure to keep the collywobbles away. Daddy's favourite bit: The great transformation from scrawny youth to fully fledged werewolf at the back of the book. Our friends at MyLittleBigTown kindly sent us copies of some of their latest books and amongst them was one of their new range of 'Tiny Twisted Tales', bite-sized books with rhyming text and illustrations by one of the busiest guys in the business, Calvin Innes. Calvin is tightly involved with most of MyLittleBigTown's output, mostly as an illustrator but in this case he's wrestled with words and rhymes to bring you a twisted tale of a man who really loves eating insects. Entomophagic Stuart the Bug Eating Man isn't well read, he's not vastly knowledgeable but he really does like to chow down on centipedes, scoff spiders and slurp slug juice. Poor Stuart's wife despairs of him and urges him to go out and get a proper job. With a flash of inspiration, Stuart hits on a brilliant idea - to merge his career with his love of troughing on creepy crawlies. From then on Stuart becomes...the Bug Eating Guy! I was quite surprised that Charlotte loved this book as much as she did. It's the sort of thing I could imagine young boys finding endlessly fascinating but my little girl, though blessed with an innate knowledge of Disney princesses and fairy tales, does seem to like icky gross stories too. It really reminded me of the fantastic Edward Gorey stories though it's not quite as dark and gothic as those. We look forward to seeing the other tiny twisted tales arriving soon from MyLittleBigTown. Charlotte's best bit: Stuart's super-cool bug-shaped bling! Daddy's favourite bit: Gross liquidized slug shakes! Yum! Scribbles is a cat who loves to...scribble! Ink is a mouse who loves to paint and ink. The two live side by side but absolutely detest each other's work. Ethan Long's artistically inspired book finds out what happens when the two clash spectacularly, and decide to play a series of artistic tricks on each other after they get fed up with constant cross-critiques and arguments over who is the best artist. I love the busy feel of this book and the two characters who remind me of a good few illustrators I know (and love). For youngsters, it's the classic combination of cat and mouse, which gently draws (oh god, pardon the artistic pun) them into a world of appreciating some of the finest pieces of art ever to adorn a wall. The great thing about this book is that it becomes a jumping off point for children to go and investigate the stories and the circumstances behind Scribbles and Ink's final pieces (we won't ruin the surprise for you but this was definitely my favourite bit of the book). Charlotte's already fairly arty and knows exactly what she likes ("Not your drawings daddy, your drawings are silly!") so it was great to be sent a book that delved deeper into the art world in a really child-friendly way. Look out also for Scribbles and Ink's next book "Scribbles and Ink - Doodles for Two" which is more interactive and encourages children to try out some artistic tricks and techniques for themselves with helpful tutorials from the terrible twosome. Charlotte's best bit: Scribbles the cat. She preferred his etchings. Daddy's favourite bit: The beautifully drawn homages to famous artists at the end of the book. So brilliant! Zombies. Not the sort of shambling brain-obsessed monsters you'd really expect to see anywhere near children's fiction, but how about zig-zag zit-faced zombies? Not obsessed with feasting on the rich goo you keep between your ears, but the sticky green matter you keep up your nose. That's right, not brainnnnsssss but boggggieeeessss! Welcome to our early review of the second "Gorgeous George" novel from MyLittleBigTown's dynamic duo, Stuart Reid and Calvin Innes. We rejoin our intrepid hero as George's town recovers from the complete trashing it suffered in the first Gorgeous George novel, Gorgeous George and the Giant Geriatric Generator (which we gave an awesome 4 out of 5 to back in February), another disaster is on the horizon. Spilled toxic waste, an innocent nursery field trip and a rather nasty infection mean that once again George's (newly rebuilt) school is under threat, and George aided by his trusty sidekick Allison and his mad rambling farty Grandad Jock, must thwart the rather gooey new menace - Zigzag zit-faced ZOMBIES! It's fair to say that this novel isn't one to read while enjoying a nice plate of winkles, nor is it one to browse while you're eating a choice piece of eel pie. But at ReadItDaddy we know that children absolutely love anything mildly gross, so they're bound to fall in love with George's new adventure which is due for publication in January 2013. The story unfolds at a frenetic break-neck pace with thoughtful introductory narratives courtesy of Grandad Jock (who manages to pause between blowing off to deliver some quite interesting nuggest of scots-flavoured wisdom) and there's no time to hang around mulling over the finer points of how nursery kids can be transformed into bogie-obsessed zombies (half an hour of Tree-Fu Tom might do the trick perhaps?) Soon George's plight becomes a fight for sanity and sanitation as he fights shoulder to shoulder with his trusty newly formed gang. Will George save the day? Will George's dreamy new teacher ever fall for his charms? Will the snotty little girl from Class B ever stop wiping her nose on her braids? I'm afraid that you mere mortals will have to wait until January to find out, but if you loved George's previous geriatric generator adventures, you'd better get queueing up to fight the zig-zag zit-faced zombie menace before they come for you and your crusty nostril minings! Daddy's favourite bit: The fast frenetic pace, and a skilful and masterful adaptation of the classic Zombie genre for a kid-friendly audience. Oh and bogies. Lots and lots of bogies! 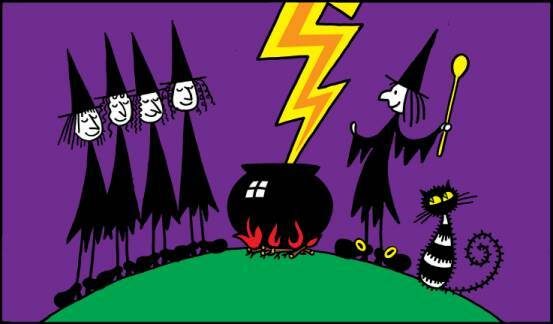 Hubble, Bubble, Toil and Trouble! It's getting closer and closer to Halloween and the shops are struggling to balance between starting their christmas displays, packing the shelves out with fireworks, or stocking christmas stuff. Mary Howitt's deliciously dark poem expertly re-spun in silken threads by the master of the macabre, Tony DiTerlizzi. It comes as no surprise that this was a book of the week when we originally reviewed it. 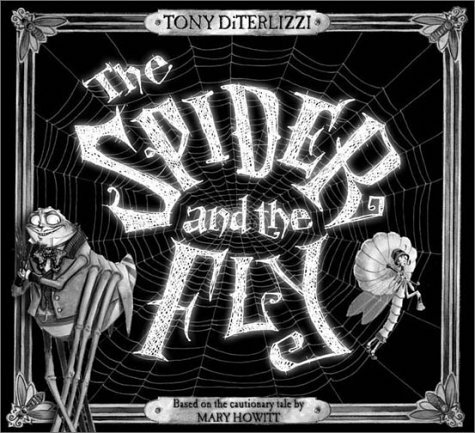 The stark greyscale images are beautifully done, and Spider is such a cad, a bounder and a scoundrel that it's impossible not to like him. It's not a particularly scary book but it's that rare thing, a children's book that doesn't let you down at the end with a sugary sweet saccharine conclusion. Perfectly dark storytelling for halloween. Top storytelling chap Giles Paley-Phillips seems to be one of the busiest and most sought after children's authors at the moment, and he's a chap after our own hearts who loves monsters nearly as much as we do. 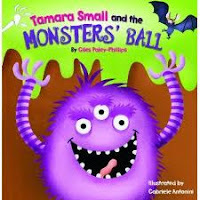 We loved his first book "The Fearsome Beastie" (which is also a great halloween read) when we reviewed it and Giles kindly let us take an early look at Tamara Small and the Monsters Ball back in August. 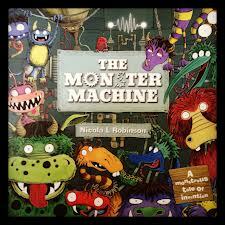 It's subsequently been released and has been a massive hit, kids love the mix of monsters, mayhem and funky dancing. We can't wait to see Giles' next book! Helen Nicoll's recent untimely death robbed children's literature of one of its brightest talents. I loved the Meg and Mog books when I was a kid, but I personally think the very first book "Meg and Mog" was the very best. Meg came along a very long time before Winnie the Witch and introduced children to the notion that not all witches are evil old hags who eat eyeballs and monkey fuzz for dinner. Along with her trusty sidekick Mog, Meg soared the skies on her broomstick with her other friend Owl along for the ride. I had no idea that this was turned into a TV series back in the early noughties, time to hunt out some episodes and re-read the books too for halloween. 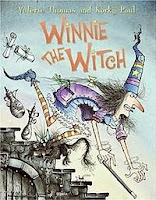 She's a hugely successful figure, she's drawn by one of the most talented chaps in the business so it's no surprise to see Winnie the Witch in our top ten. Like Meg and Mog, Winnie and Wilbur delight children with their slightly madcap and crazy antics, and spells that don't always go according to plan. For us though, the joy of a new Winnie book is always seeing just how much tiny little detail goes into one of Korky Paul's illustrations (and we also giggle at his various references to Apple computers that seem to work their way into the books regularly). Charlotte secretly loves Wilbur more that Winnie but still always likes to dress up as Winnie herself every Halloween. ...you'll have to read the book to find out what her achilles heel is but it's such a beautiful and darkly woven tale, it's perfect for those torch-lit story sessions as you huddle under the duvet on All Hallows Eve. Uber-talented artist and author Nicola L. Robinson also happens to be one of the nicest people to converse with on Twitter. We were lucky enough to be sent 'The Monster Machine' for review and we completely fell in love with its cavalcade of different monster characters, as well as the young lad and his dad who end up inventing the machine that creates them. We're massive fans of detailed art, and Nicola's steampunk-esque machines, wild and whacky monsters and a rather neat little nod to 'Titanic' won us over (and from what we read elsewhere, won a lot of you over too! Hooray!) Definitely a worthy addition to our list and a former book of the week too! Yay! We haven't reviewed "La Visite De Petite Mort" yet on ReadItDaddy but it's not for the want of trying. I originally read this in a bookstore in Paris and fell completely in love with it, despite it being one of the darkest children's books I've ever read. Every time Amazon get this in stock it seems to be ridiculously expensive, and goes out of stock fairly quickly but if you're lucky enough to visit some of the really brilliant bookstores over in France, and spot this, grab it with both hands. 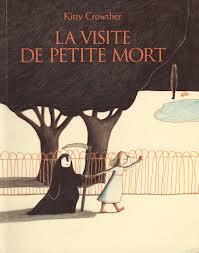 French children's books have a knack of dealing with really difficult and surreal subjects and this is no exception. I won't spoil the surprise for you but seek this one out, it'll chill you to the bone at halloween! What do you give a little dragon who cries tears of pure gold? No not an onion you rotters, you give them a lovely house to live in all of their own. Only Little Dragon's house seems to already have a few chain-rattling incumbents so what can Little Dragon and his friends do about their ghostly infestation? This delightful little book scored such a big hit with Charlotte that I didn't think we'd ever be allowed to give it back to the library (Hooray that children don't get fined!!) Monsters, ghosts, and a classic haunted house are all wrapped up in this book's seemingly innocuous covers. Perfect to go along with those halloween sweeties! 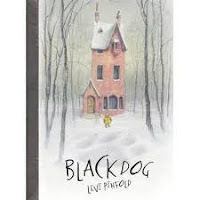 I know you're probably getting a bit bored with us telling you how great "Black Dog" by Levi Pinfold is. But we won't stop, until you've all bought it and devoured the delicious artwork, the dark tale and the sheer and utter brilliance of one of the best children's books of the year. "Black Dog" is a tale about confronting your fears when a problem seems bigger than it actually is, but it's told in such a way that it doesn't feel preachy or shouty - but celebratory. Levi Pinfold is, without a doubt, a heck of a talent and someone to keep a very close eye on in future as we've got a feeling it won't be the last of his books to feature as one of our "Book of the Week" choices. 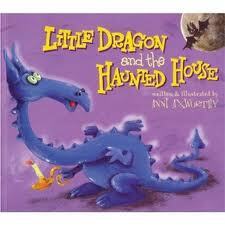 Oh my, we were really in two minds whether to feature this one as one of our Halloween Book choices. It's dark, and it's actually fairly disturbing if you've a youngster who hasn't quite progressed beyond needing the landing light or a night light on. A little girl switches off the light at night to find that Darkness is actually a playful and slightly mischievous 'thing' that likes to play tricks, likes to grab, likes to dance and above all likes to wrap himself around your most cherished objects until you can't see them. 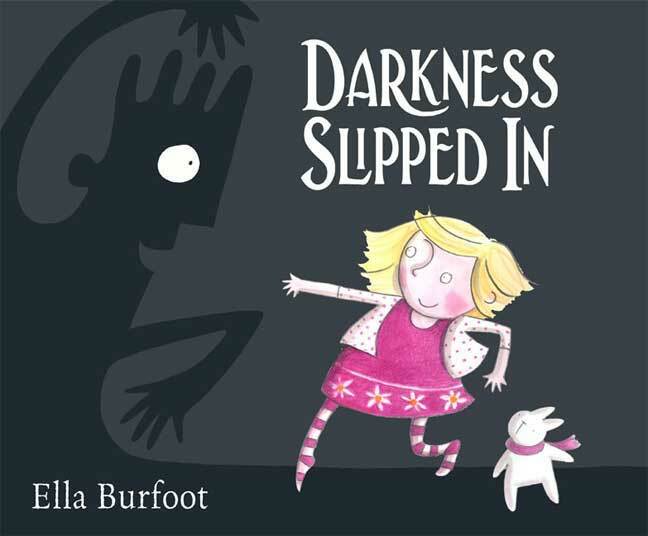 I spotted the potential danger in this book as a bedtime read straight away but in time-honoured fashion, Charlotte was having none of it - and absolutely devoured this dark little tale. 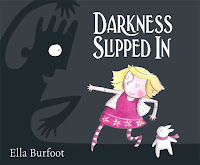 Something about his shadowy appearance, his expressions and his spiky hair just made the darkness in this book stick in the mind (and if it works on me, it'll definitely work on your young impressionables!) Nevertheless it's a definite shoe-in for inclusion in our halloween list. So there you have it, that little lot should keep your collywobbles wobbling. Don't have nightmares! A new David McKee book is always something to shout about. A new Brett and David McKee book (Father and Son) is even better, as the two work so well together that you can barely see the join. "George's Invisible Watch" has all those wonderful characters in it that you expect from anything David McKee gets involved in. The hero, a young lad named George, becomes the town's preferred timekeeper when he's found to have an uncanny knack for knowing exactly what time it is. At first his friends and parents scoff at his ability, but time and time again he's proved right so people begin to actually believe that he really does wear an invisible (and highly accurate) timepiece. Of course, McKee's books are renowned for containing a rather neat little moral tale woven tightly into the plot, and the moral of this story is a lesson in what happens when you take something (or someone) for granted. George is an endearing character (despite actually being fairly naughty at the end!) and I just can't get enough of McKee Senior's drawings. So great to see he's still producing such brilliant stuff for kids, generations on from Mr Benn. Charlotte's best bit: The idea of an extra-long playtime. 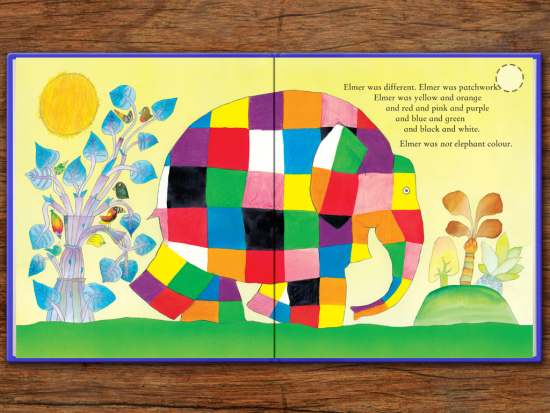 Daddy's favourite bit: David McKee's various cool and colourful character drawings are so utterly brilliant (and the barking dog page split thing is just awesome). We're really struggling under the weight of some seriously brilliant books this week and the first to knock our eyes out was kindly sent to use by the superb Mat at PGUK / Quirk Books. We've been rooting for this one for a while so it was great to finally be able to take a look at it. Being slightly 'arty' (read: absolutely hopeless) and having a daughter whose artistic ability is far outstripping my own, this book is an absolute must. So why 'Fill in the Blank'? What's so special about another sketchbook? Well this one sets up various pages, designs and scenarios to give you a spark of inspiration for your drawing. Sometimes you'll get to design a billboard for an ad campaign, other times you'll be doing some fantastic tattoos on someone's back or drawing the most wild and whacky pair of shoes you can possibly imagine. A really brilliant and novel book / sketchpad. Perhaps aimed at older children but even for an inquisitive and artsy 4 year old, it's an excellent and original idea. Daddy's favourite bit: Trying to remember how to draw high heeled boots for some of the 'feet' designs in this. I barely got a look in though, Charlotte wouldn't let me! Last week we felt a bit deflated and disappointed with Cinderelephant - a classic children's fairy tale retold with just a few cursory changes in place to mark it out from the original. This is most definitely NOT the case with "Goldilocks and Just the One Bear" which takes the classic Goldilocks story and muses on what would happen several years later when Baby Bear is all grown up. We've previously read "The True Story of Goldilocks" which is a neat little prequel to events, and explains how Goldi became so naughty so this is a neat little sequel and a lovely treatment of the characters and situations by Leigh "Sunny McLoud" Hodgkinson. (No longer Baby) Bear gets horribly lost in the big city amidst the noise and bustle (and some rather amusingly named shops and buildings in Leigh's fantastic cityscapes). Seeking a quiet nook to get away from the hustle and bustle, Bear finds himself in a rather plush apartment and tries to make himself at home. But there's something very familiar about the situation, and something even more familiar when the apartment's owners turn up and wonder who's been eating their...er...cat food, toast and goldfish! Leigh's illustrations are superb, the story is excellent fitting snugly in with the Goldilocks tale, and we love the way it ended too (but of course we're not going to spoil that for you). Charlotte's best bit: "Goldilocks Grown Up is ME!" she said. Daddy's favourite bit: Leigh's busy cityscape. Must stop by "Wolf's Clothing" for a new jacket sometime! I ran out of fingers and toes trying to count how many sleeps it is till Christmas, but if you're super-organised and are doing your christmas shopping now rather than rushing around the shops on Christmas Eve, here's a lovely little stocking filler for children that is chock full of the things that make Christmas the most wonderful time of the year. "When I dream of Christmas" is so warm, fuzzy and cuddly that it's perfect for counting down each bedtime until the big day arrives. Beautiful illustrations are accompanied by child-friendly text to really get you in the festive mood. It's nice to see the real reason for Christmas paid proper due here too amongst the presents, candy canes and Santa. Alongside Top That's other lovely Christmas book "Fuzzy Christmas", it's a lovely little book and anything that can make us feel this festive on a cold wet October morning really does deserve book of the week! Charlotte's best bit: Presents! Oh and Chocolate of course! Daddy's favourite bit: Santa's scratchy beard and the beautiful illustrations in this book. The Froobles are quickly becoming megastars as part of Top That! 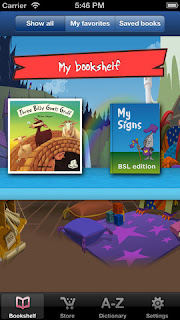 Publishing's flagship range of books, activities and apps for young children. It's easy to see why they are so popular, there's a character there for just about everyone (Personally I think Little Jack Potato is great but very naughty, while Charlotte absolutely loves Sienna Strawberry because she loves to dance and wears a ballet dress!) and they're going from strength to strength with new merchandise, new characters and new books coming very soon (more news on those new characters through this link). Back to the Froobles Fun Things to Make and Do Book, which was kindly supplied by the fab folk at Top That! The gang are ready for a huge selection of activities, makes and recipes in this fun and attractive book. Making everything from cool paper aeroplanes, butterfly prints, chocolate crispy cakes and even a selection of naughty Jack Potato's best japes to play on family and friends, it's packed to the gills with interesting things to do on rainy or sunny days. Best of all, there are tons and tons of stickers at the back of the book that can be used for some of the activities, or just to decorate your own stuff at home (Charlotte has proudly stuck Sienna Strawberry on one of her favourite toy cars). I don't think I've ever met a child that doesn't love stickers, so they're a great addition to the book. If you're already familiar with The Froobles then you'll love this activity book. If not, definitely check out the Froobles Website and meet the gang! Charlotte's best bit: Butterfly printing and Sienna Strawberry! Daddy's favourite bit: Those groovy cress heads! Springboard Stories is a veritable cornucopia of brilliant ideas gathered together in an interesting website, supported by fantastic quality paper publications too. We were lucky enough to be sent one of Springboard's latest books and it's a superb animal tale with a rather poignant message. So let's make like a Platypus and dive in! Children familiar with Aesop's Fables, or more recently the excellent Tinga Tinga Tales will love "How the Platypus Got His Shape" by Anne (Tiddalik) Faundez. It tells the story of a beautiful but incredibly vain animal whose lustrous rainbow-hued fur, beautiful retroussé beak and huge shiny eyes became the rather odd creature we know (and love) today. Platypus was once a dazzling spectacle to behold, strutting around admiring himself in watering holes and pools, so exactly how did he end up transformed so dramatically? You know what I'm going to say. You'll have to read the book to find out. The book is beautifully illustrated by the Walmesley brothers (we particularly loved Platypus in his original form, and that's become Springboard Stories' hallmark, quite rightly so!) and one rather interesting aspect of the story is the words it uses, designed to compliment and stretch an early reader's vocabulary with some quite weighty language that flows beautifully to build the story. Please drop by Springboard Stories and follow them on twitter (@sprngbrdstories) as they are doing some amazing things. There are some really naff 'free' books on Amazon's Kindle Bookstore, and it's even harder to find Children's Books that work in e-reader format. Tom Watson's "Garbage! Monster! Burp!" bucks the trend nicely with a book that not only features charming illustrations (that reminded me of Fuzzy Felt for some reason), but packs a wallop of a message about rubbish, recycling and taking advantage of others. A successful town thrives on the top of a hill but relies on a friendly well-meaning garbage-eating monster to dispose of the vast mountains of rubbish produced every day. The monster quite happily scoffs all the garbage, but as the town grows, the poor monster finds itself (quite literally) stretched to capacity until one day he can't manage to eat any more. The mayor (like all political figures) has absolutely no sympathy for the poor monster and tells him to tuck in or get out. Thankfully the monster has some rather sweet allies who see exactly what the problem is, and step in to help. It's a wonderful freebie for those of you who are dipping a toe in the water of buying an e-reader (the new Kindle Fire HD is definitely looking like the perfect thing to read great little books like Garbage! Monster! Burp! on) or even picking up a tablet (bookstores and Kindle are available for just about everything, even Apple products. Nice work Tom, hope we get to see more from you very soon! Charlotte's best bit: The monster burping on the mayor! Daddy's favourite bit: A weighty eco-message not rammed down your throat, but delivered in a fun, charming and amusing way. 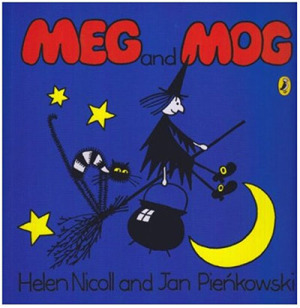 Here at ReadItDaddy we were very sad to hear that Helen Nicoll, Author of the sublime Meg and Mog books, has passed away at the age of 74. 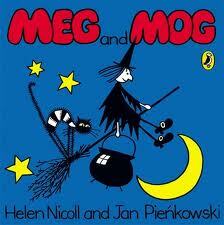 With her long-time collaborator and illustrator friend Jan Pienkowski, Helen created the best selling Meg and Mog books. These were some of the first books I read as a child, and it was great to read how Helen and Jan used to meet at a Motorway Service Station to fine tune the books and illustrations before they were sent to the publishers. A busy, fizzing whizz-bang of a book that has nothing to do with shonky 80s electrical goods retailers, "Rumbelow's Dance" is proof positive that Quentin Blake's energetic scribbly drawings can turn just about any children's book into an instant classic. The man behind the fantastic illustrations of Roald Dahl's timeless children's books is on top form. The story, about a young boy named Rumbelow who cheers up travellers making their way to market by encouraging them to "dance, dance, dance to market" is the children's literary equivalent of a good bum-wiggling tune. It's so easy to get caught up with the rhythm of the story and it's a real joy to see how children react to Rumbelow's effervescence. John Yeoman's rhyming text bounces as much as Blake's drawings, to make a really pleasing little book discovery nestling amongst the shelves in Abingdon's extremely well stocked library. Charlotte's best bit: The flower lady ("She's me" said Charlotte). Daddy's favourite bit: Blake's flowing, scribbly but absolutely perfect drawing skills.